A young family deals with their son’s sudden strange behavior after a visit to a secluded Christmas tree field. Students film a documentary in an abandoned building where unsolved murders occurred. A prodigal nephew goes to a country manor to beg money from a wealthy aunt, only to put his entire family in danger of being slaughtered by Krampus. All this plays out, while Santa deals with a zombie elf outbreak in the toy shop. Interwoven throughout the action are scenes of William Shatner doing his Shatner thing in all of its hypnotic glory. Fans of the Ginger Snaps films will be happy to return to the little town of Bailey Downs in the new anthology feature A Christmas Horror Story. The film opens on a computer generated North Pole (one of Christmas’ few weaknesses is this cheap looking fractal landscape and architectural animation). A wounded, battle-ready Santa Claus stands in the reindeer stable, chest heaving, a bleeding claw wound on his face. The structure is under siege from an unseen force banging at the doors. Bright white light shines through the widening gap in the doors as whatever waits outside tries to get in. 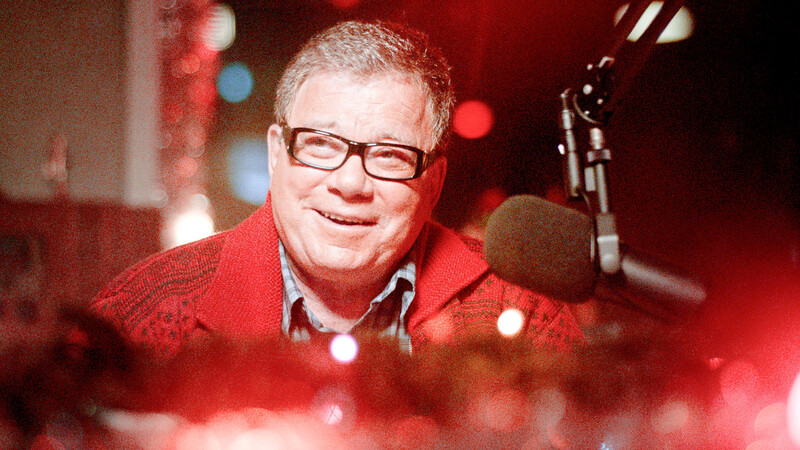 The film cuts to 12 hours earlier and DJ Dangerous Dan (William Shatner) is broadcasting from a lonely radio station on Christmas Eve. It’s just Dan and his Scrooge-esque producer, Norman. Visibly disgusted by Dan’s Christmas cheer, Norman storms out of the station, DJ Dan tells listeners that Norman is on his way to the Bailey Downs Mall for a radio remote broadcast. The film is cleverly constructed. The Dangerous Dan scenes seem, at first, to serve as a classic horror anthology wraparound. However, in A Christmas Horror Story, it dawns on the viewer that characters crossover into each others’ storylines. Other than the gonzo segments featuring Santa’s bloody battle with undead elves at the North Pole, the tone is consistently spooky and dark throughout. The four concurrent and interconnected stories somehow lead to Santa’s predicament in the stable from the film’s opening. The Santa segment feels like a square peg in a round hole until it is brilliantly linked to the overall story at the film’s climax. A Christmas Horror Story is a cut above most good horror movies of late. The CG North Pole that opens the film is quickly forgiven because the storyteller’s resources were devoted to loftier ends. Care was taken to serve the style, tone and story and to bring out the best in the cast. Oluniké Adeliyi gives the standout performance as the tormented mother of a little boy who acts strangely after disappearing at a family outing. Adeliyi is one of the most riveting and watchable actors that I’ve seen in a genre film in years. The entire cast treats the material with a reverence that is missing from most contemporary horror films. Their focus elevates A Christmas Horror Story, and guarantees that viewings will be an annual tradition by many horror fans. After all, Christmas and horror stories go together like chocolate and peanut butter. SYNOPSIS: Christmas is supposed to be a time of joy, peace and goodwill. But for some folks in the small town of Bailey Downs, it turns into something much less festive. When Krampus – the anti-Santa who punishes the naughty children – is summoned by a young boy, everyone’s fight for survival begins.